Everyday, millions of Filipino children walk barefoot on terrain that’s not only unsuitable but hazardous to their health. Flip flops are a simple but effective solution. They’ll greatly improve these childrens’ lives and their chance to succeed. Help protect a child from the danger of debris and disease rampant in their streets.  Provide a pair of flip flops to children whose feet are bare. contracting soil-transmitted diseases, which are able to penetrate the skin through bare feet. can’t receive an education, perpetuating the cycle of poverty. 100% of your generous donation goes to putting shoes on the feet of barefoot Filipino children. Unfortunately, millions of poor Filipino children grow up without shoes running the risk of contracting soil-transmitted diseases, which penetrate the skin. Without basic footwear, cuts quickly become painful and quite dangerous particularly once the wounds become infected as routine medical care is often unavailable to these children. Your kind donation, regardless of the amount, will go to provide flip flop sandals to protect the feet of poor Filipino children and save them from many medical problems. You will be making a real difference to real children who with your help will have a much better life. Help these children today by joining our cause and getting involved. Once purchased, we'll send flip flops and other items to our partners in the Philippines who will distribute them to those with the greatest need. Your donation will bring a healthier future to children who otherwise would have had no one to help them. Kids over there will finally be able to safely walk to school and get the education that they want and deserve. in the Philippines to distribute your donations to poor families and children.